The third Bikini Bar Takeover is around the corner. On Sunday 28 May, Bikini will be finishing the weekend with a BANG in their Bikini Front Bar! 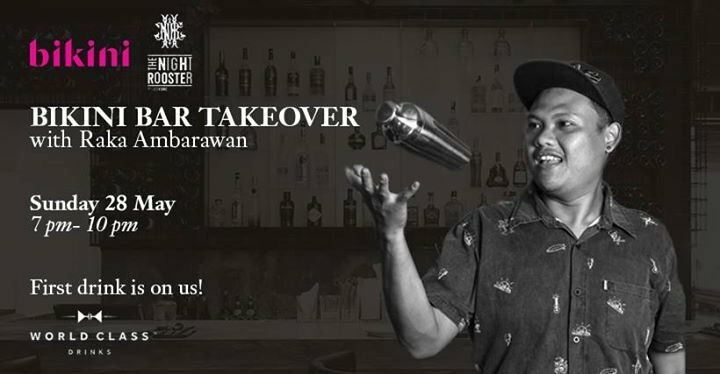 This time around Bikini will be welcoming Raka Ambarawa, the owner and mixologist of Locavore’s The Night Rooster. Like Bikini's own Head Mixologist Arey Barker, Raka is passionate about experimenting with the combination of premium spirits and local ingredients, always looking for that extra-special marriage of flavours. Kemangi Belanda (Kemangi, lime juice, Dry vermouth, Ketel One vodka, aromatic bitter). The evening will kick off at 7pm in the front bar.